If you’re Shopping for Plaid Bedding Sets for your Home, then browse Ease Bedding Online Site to find the Best Bedding Set from a large Selection of Sets for your Beautiful Home on very Affordable Price and with good Reviews. Mix and match Colors, Prints and textures to reflect your Unique Style or take your pick from Versatile, matching Sets, which can make any Bedroom look Great. Ease Bedding has something to Suit every kind of Bedroom Decor! This Collection of Beautiful Bedding Sets has been thoughtfully put together to give you the perfect combination of Comfort and Style at the same time. It is on Point with the latest Trends in Decor, Fabric Choices and Combinations, all to Inspire you. Eddie Bauer Down Alternative Comforter sets feature Eddie Bauer iconic prints. Made of super soft micro suede filled with alternative down to eliminate allergies, provides extra warmth for those colder nights. Easy to care for. Made of super soft micro suede filled with alternative down to eliminate allergies, provides extra warmth for those colder nights. Coordinate with our Eddie Bauer blankets and sheet sets to complete the look. Sleep soundly and luxuriously with DaDa Bedding Reversible Plaid Floral Purple Blueberry Patch Reversible 5-Piece Quilt Set. Add elegance and style to your home with this soft and comfortable coverlet set, this will remind you so much of the country air, relaxation and comfort, all in one. Lay your head on the two matching pillowcases and drift away. Available in three sizes this set will fit in any home. Enjoy this light floral country designed reversible quilt set for a warmer and vibrantly colorful room! Available in four sizes! If you are searching for the perfect plaid to update your room, Brody is the way to go. The top of the comforter is a Green and Blue plaid pattern that is printed onto a polyester peach skin material with a solid blue reverse. All products are 100% cotton, easy to care for, machine washable. Eddie Bauer takes inspiration from a classic buffalo check to create a bold, tailored look for your bedroom. 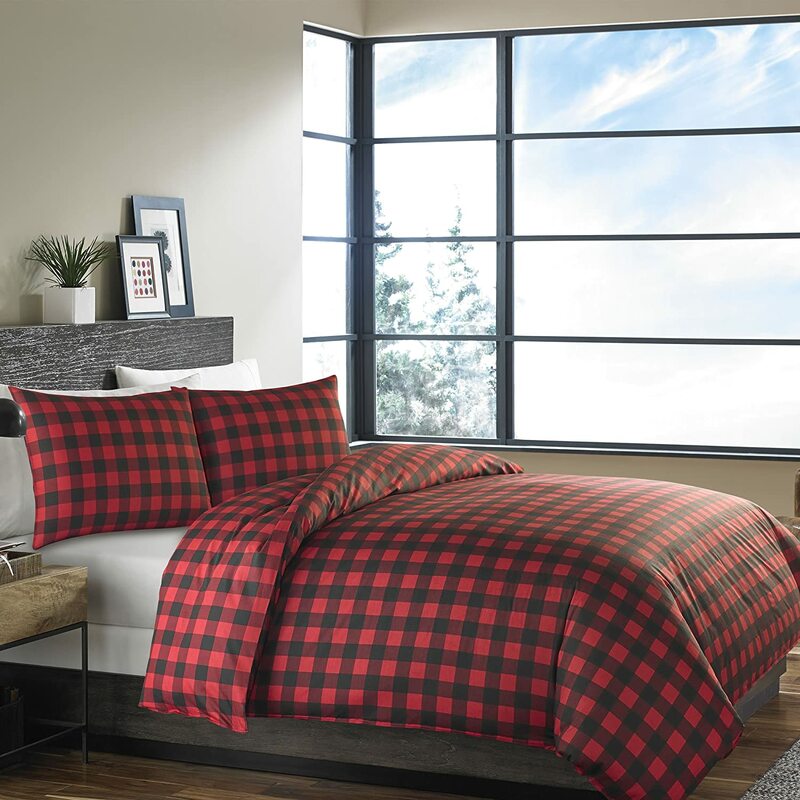 This iconic plaid in Scarlet Red and Black will bring peaceful dreams of the outdoors inside while you sleep in comfort. Spruce up your space with the Woolrich Lumberjack comforter set. For that cozy cabin feeling, this comforter set features a Khaki and Brown plaid pattern printed on soft spun for comfort and fashion while a beige brown reverse completes this ensemble. Attractive updated plaid design is perfect for a fresh new look. Set features a unique design on the front of the comforter. Taupe and blue vertical stripes work their way from the top of the comforter down and meet red stripes on a blue base for an interesting pattern. Two decorative pillows feature piecing and twill tape details for added dimension. This Set is Selling so fast and have very Good Reviews! A timeless tartan plaid in a rugged palette of dusted indigo, saddle and putty neutrals and an accent of scarlet creates a classic tailored look for your bedroom. The comforter reverses to a handsome neutral check in saddle, another menswear-inspired element adding a further note of tailored elegance. Get a great night sleep while adding a splash of fashion with this plaid print. The down alternative comforter mini-set is super soft is reversible so you can easily change your comforter to a solid look. 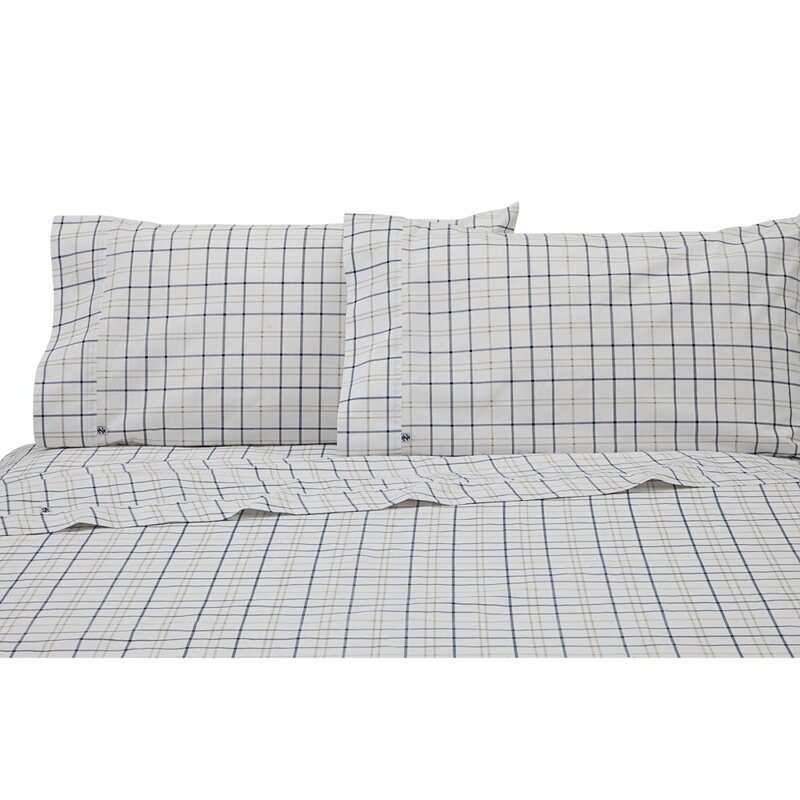 Eddie Bauer Nordic Plaid Comforter Set, includes Comforter and Standard Shams (1 sham in twin set). Ultra Soft Micro Soft fabric features iconic Eddie Bauer Nordic Plaid Print. Eddie Bauer Cotton Flannel Duvet sets include Duvet cover and shams. Set is 100% cotton, brushed for extra softness and preshrunk. Great way to update your bed. Coordinate with Eddie Bauer Sheet Sets, Throws, Blankets and Quilts to complete the look. Red and Khaki two Colors available to choose from them!! Twin, Full/Queen and King Sizes are there for you to choose the best size!! Spruce up your space with the Woolrich White River comforter set. For that cozy cabin feeling, this comforter set features a blue and brown plaid pattern printed on soft spun for comfort and fashion while a chocolate brown reverse completes this ensemble. The Cascade Lodge collection incorporates rustic bear silhouettes with pinecone accents and geometric elements on warm chenille. Beautiful Red plaid and rich faux leather complete the cozy lodge ensemble. A wide variety of coordinating accessories are available; consider combining this pillow with other Cascade Lodge pieces for a complete look. The updated plaid in this Mizone Harley Comforter Set gives a modern approach to this simple classic. The bold black plaid is highlighted by a white background and pops of Red while a solid black covers the reverse. I love this Bedding Set, because it’s absolutely simple and gorgeous at the same time!! You can paired this comforter with a country rose quilt and it’s beautiful. It is substantial, cozy, and very well made. This comforter set is very pretty and extra large for a full size bed. Certainly no skimping on the size. It is very soft and warm to sleep under. Full/queen comes with two regular size pillow shams. It is very beautiful bedding Set!! Eddie Bauer Nordic Plaid Comforter Set, includes Comforter and Standard Shams (One sham in twin set). Ultra Soft Micro Soft fabric features iconic Eddie Bauer Nordic Plaid Print. Down Alternative Fill. Grey Plaid, the one which is listed above! This three piece bedding set is made from Cotton and it looks so nice!! It is a great choice to choose this bedding, when it comes to a more glamorous appearance and a feeling of pure luxury. Egyptian cotton is the world’s finest cotton and this comforter is made of it, so Customers love it!! The strength of the fiber makes fabrics more solid and more resistant to stress. One Duvet Cover – Two Pillow Covers – Queen Size: One Duvet Cover – Two Pillow Covers. Duvet cover has nonslip corner ties and hidden button closure and shams are finished neat with envelope closures. It is machine washable gentle cycle with cold water and tumble dry with low heat. Very good quality and size is good! Very nice sheets and pretty good quality. Love this blanket, because color is so nice and it is Super soft!